We’ve got a string of new arrivals to announce. 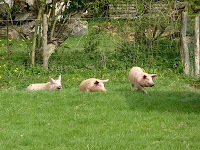 First up, this year’s piggies, a trio of Tamworth/Bayeux ladies. Our latest volunteer, boat-building-qualified Chris, had the necessary woodworking skills to make running repairs to our pigs ark, which were fraying about the edges after three years of service. 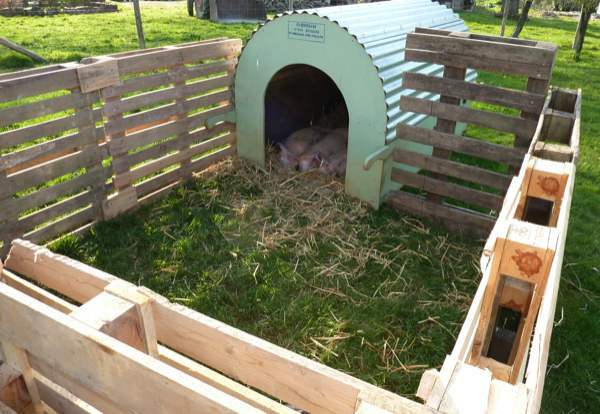 The pigs have come direct from a sty, so we built an enclosure out of wooden pallets around the ark to provide them with a reassuring sense of security for the first few days in their new home. Two days later, we removed one corner of the pallet fence to allow them to explore the wider world in their own time. 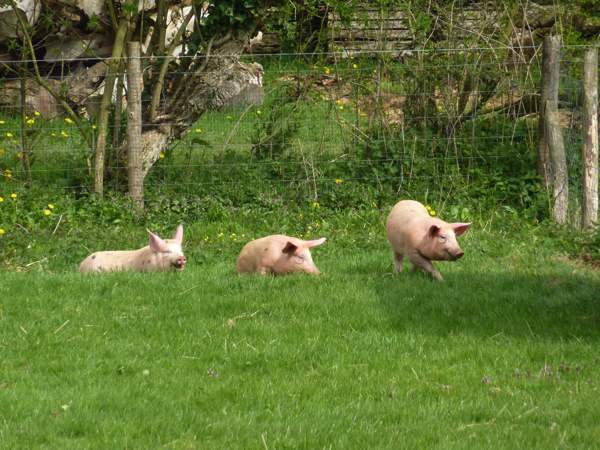 A further two days of walking about under the sun and we now have the new smallholding pleasure of rubbing suntan cream into scorched pigs ears! 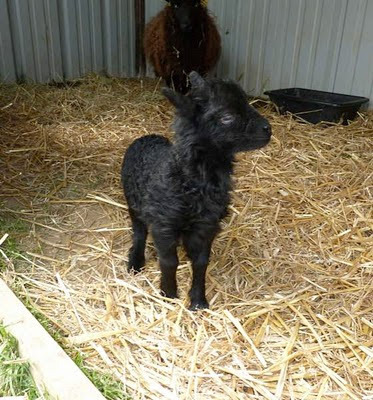 The same day, our final lamb arrived—another girl, making two of each this year. As usual, I had a quick look over the lamb, then tipped mum onto her backside to have a squeeze of her teats. There is a (strangely) blue waxy plug to keep the teats hermetically sealed and a couple of tugs was enough to jet a stream of milk and reassure me that all was well downunder. The first milk, the colostrum, is essential to give the lamb the antibodies it needs. Her eldest brother, Valentin, was born back on 14th February and is quite a big chap now, so, for the first time, I decided to isolate mum and lamb for the first twelve hours to make sure mum got a fair share of sheep nuts and the pair of them were spared the inquisitive noses of the other ewes and lambs. Five days later, we took the afternoon off to go fishing. The pond at the end of our horizontal plant filter grey water treatment system has been established for six months now and is home to a variety of watery wildlife that has turned up of its own accord, such as newts, diving beetles and daphnia and it was high time we added some fish. 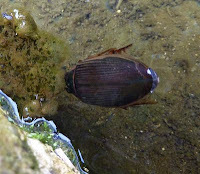 Christophe, who dug the pond and installed the plant filter, invited us over to his place to catch some common roach, in Latin, rutilus rutilus (so good, they named it twice!) and gardon in French. We borrowed a couple of rods from friends Ian and Caroline, helped ourselves to a few worms from the compost heap and headed over to Christophe's. 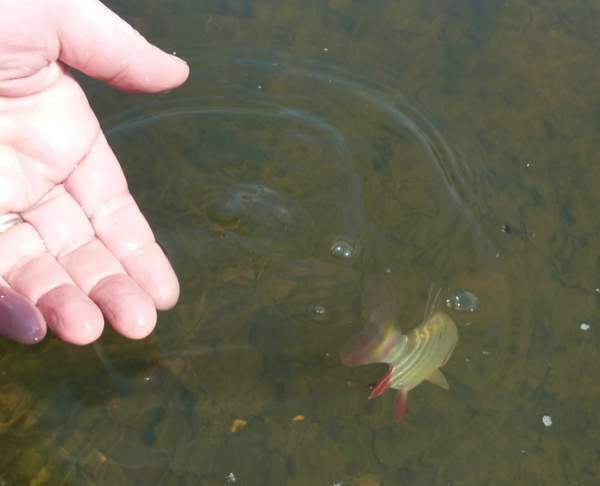 It was easy fishing and we soon had six healthy fish in our lidded bucket. They are silver fish with red fins and stick together in a shoal, so make a beautiful and engaging addition to our pond. So I read, roach easily adapt to local circumstances and have a great tolerance for organic pollution, a useful attribute as although our water is clear, remember that it is the outlet of our grey water treatment system. And as I was wondering whether they’d have enough to eat, I learn that they adapt to scarcity by growing slowly and staying slim! They’re a great addition to our livestock and we both now pause when walking by the pond to see if we can spot our small silvery shoal. And we're not the only ones! I loved hearing about your latest additions! I'm intrigued by your graywater system/fish pond, as it's something I would love to implement here. Local bylaws aren't so accepting of them, unfortunately. We're just starting out though, so there's still time! Is it possible to eat these fish, or is the water quality too bad for that? Fish is a good source of phosphorus,just dig them in on vegetable beds or under fruit trees. Thanks for all your comments, Kent, Carol, Cheryl and J.
Cheryl: the regulations here are such that our system isn't "aux normes" i.e., regulation, because there aren't any regulations for it yet. 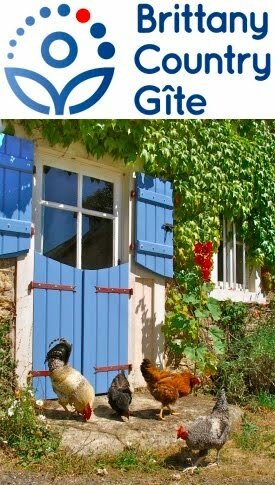 We have been given "une lettre de dérogation" by our maire i.e., a permission to break the rules. We will ahve our water tested at various stages by the authorities and this will be part of the process that forms the regulations for these systems. We're thus pioneers/guinea pigs. J: A sensible idea, trying to get another "output" from the system: very permaculture. 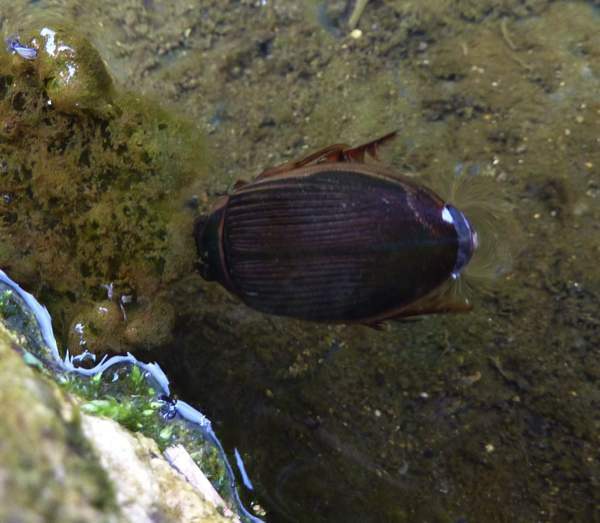 We aren't feeding them, so their food is just the natural plankton in the pond and so they wouldn't grow that large. They should reproduce but I'm not sure that they'll be an excess to take for fertiliser. I would hope that water quality wouldn't be a problem. We certainly are very careful what products we use to wash our dishes and clothes. We'll know more when we start to get the water quality test results back. I'm not sure that Roach are good eating. On a bigger system I guess one could try trout ... yum! -I read the old posts regarding the pond again and I understand the construction better now. I sort of assumed that grey water would contain excess nutrients, thus causing algae to grow quickly. I didn't mean that the fish would be poisonous or harmful to eat , it's just that the water quality affects the taste of the fish. 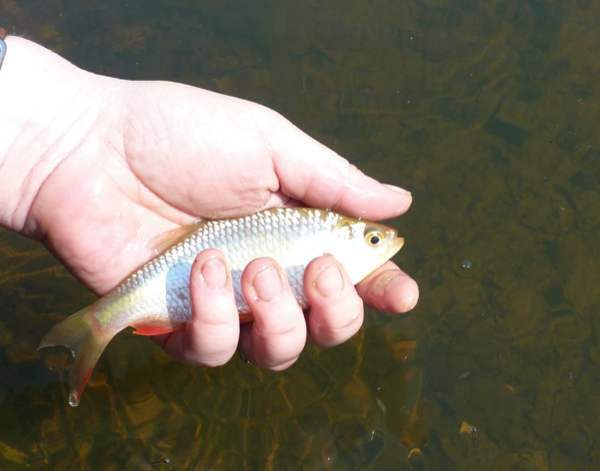 Roach caught from clean water sources like the sea or lakes with good water quality (from Lapland for example) are good for eating. For example smoked, canned, or grilled. I like to angle roach with dough bait made from wheat flour, and then use them as a bait for pike. 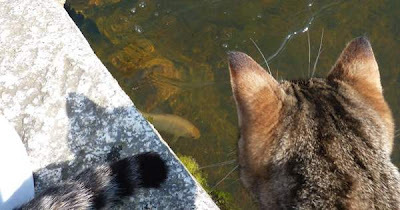 - If your pond has lot of insect life that could support more predatory fish, how about introducing perch to your pond. They can also tolerate acidic or otherwise low quality water, and are very delicious. Trout on the other hand is vulnerable to water quality. It's good to know that Roach are edible. We're in the early stages with this pond. We'll observe what goes on as the system matures and keep and eye on the size of individual fish and the population. If we get an excess, I'll get my fishing rod. As for Perch: we want a good level of biodiversity and thought that Perch would be a bit too predatory. We'll see how things go with the Roach and review what we're doing in the future. I didn't know pigs could get sunburns! I guess it makes sense. Do they ever adjust (I've never seen a tan pig) or do you always have to watch out for it?